This holiday deposit voucher is valid for 12 months from date of purchase. The balance of $300 is paid to the accommodation provider. This holiday voucher incurs a surcharge during peak seasons, long weekends and Christmas holidays (24th December – January 6th). Upgrades to spa suite, 1,2 & 3 bedroom apartments available, please refer to the accommodation provider for upgrade cost. Additional persons welcome, tariff $35 per night, accommodation only, max 3 people in a studio apartment. Palm Cove is ideally situated exactly half way between Cairns and Port Douglas, just 20 minutes from Cairns airport. The perfect way to explore the Great Barrier Reef with easy access to marinas and reefs. A few kilometres south you will find range road giving easy access to Kuranda, the Atherton Tablelands and the outback while heading north takes you to Mossman, Daintree Rainforest and Cape Tribulation. Your superb studio apartment contains a balcony or patio, kitchenette, LCD TV and DVD, iPod docking station, king size bed (or two singles) and garden or pool views on the first or ground floor. 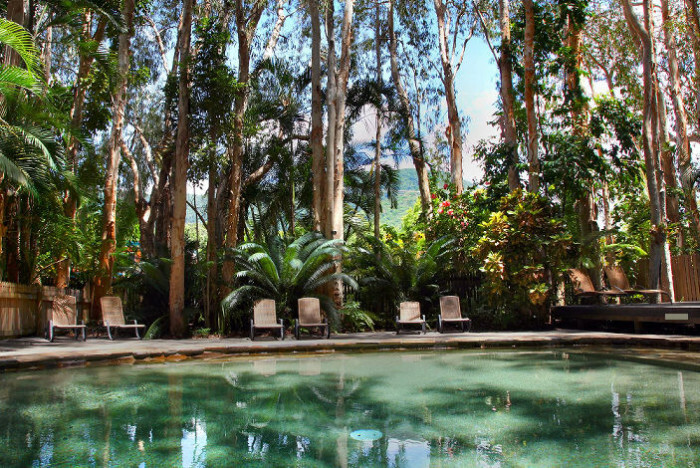 These boutique apartments are set among lush tropical gardens and green mountains! Enjoy the heated pool and spa and relax in our tropical undercover BBQ setting.